Services like Dropbox, Box and WeTransfer are user-friendly and are great for many business applications— but are they holding your media business back, or worse, putting your business at risk? 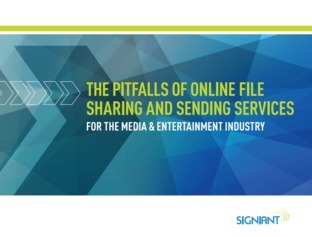 In this eGuide, uncover the 7 pitfalls of using online file sharing and sending services, and explore file sharing and transfer alternatives for media and entertainment companies with Signiant. For more information on risks associated with online file sharing platforms, download this eGuide, and decide for yourself if an alternative file sharing and transfer software from Signiant is right for your media organization.